One thing I forgot to mention in my “One of Those Weeks” posts was that I also threw a bit of a wobbly over the sight of myself in my new maternity bikini when I finally tried it on ahead of the Spa Day Sam’s work took us on Sunday. As I was already feeling “that way out” with everything just being wrong all I saw was giant thighs and hips – that was the main reason I left it in the packet for two weeks without daring to try it on as I was so worried about what I’d look like! Poor Sam – I bombarded him with questions about how it looked only to see him flounder, worried about what the right thing to say was! Once I was over my strop the next day I tried it on again and realised that it looked perfectly nice and the only difference to my figure was a big giant bump. *Phew*. I knew I didn’t want to go for a swimming costume as, to me, a bump enveloped in that material could only look worse than getting it out in all its glory. I did end up being in the minority with my choice as only one other girl had a bikini on but I am so glad I went for it. Needless to say, no one took any notice really other than to see how good my bump looked then we all just got on with our relaxing afternoon. And, yes, that’s what everyone had said to me in the first place but my rational brain had seemingly temporarily taken leave of my head! We had a lovely Spa Day courtesy of Sam’s work on Sunday and it was so nice to just relax and do nothing for a few hours. We started with afternoon tea (one of my favourite things to eat) which was great for my sweet tooth then we had use of the spa facilities for the afternoon including a 30-minute treatment. I could go in their Aromatherapy Room as it was only around 30 degrees celcius and the Jacuzzi/whirlpool was pretty cool too so I also popped in there for 5-10 minutes. Obviously I couldn’t go in the super hot Sauna and Steam Room but I was fine with chilling on a lounger by the pool reading my book whilst the others endured the scorching temperatures! I then had a facial which was fab, unfortunately a massage was a no go unless it was a specific pregnancy one. We finished the day with a tasty three-course meal in the hotel’s gastro pub – perfect. It was funny being the massive exception in a large group of people. Sam’s bosses have grown-up kids and one of his colleagues has a 4-year-old all the other couples are yet to be married or have kids and I think they are pretty happy to wait a while until they change their situations! So there were a few questions about how I am doing and baby names etc. but it was amusing see some people thinking “I am glad that I have a good few child-free years ahead of me” which is exactly what I would have thought a few years ago. Obviously I can’t wait now and am so excited! I am 8 months pregnant today so only have 8 weeks to go until my due date! I feel I can be on baby countdown properly now as that really doesn’t seem long to wait at all. 32 Weeks also means another bumpie to add to the collection. 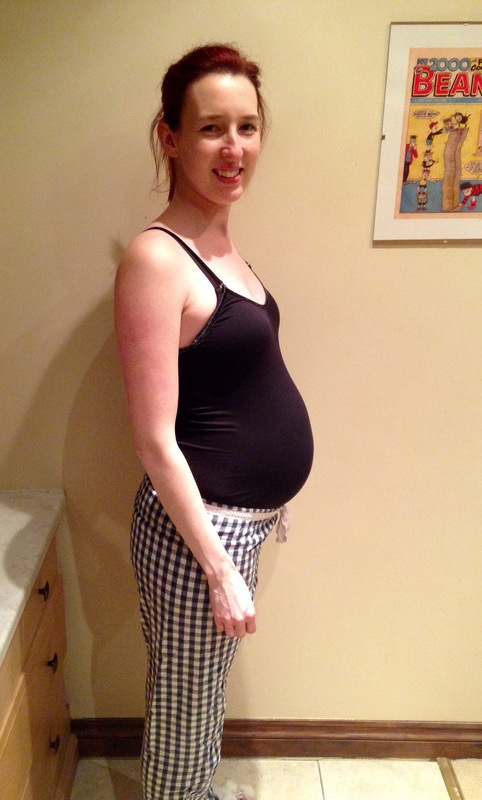 I was looking back at my first “bump” photos from the beginning of my pregnancy and it is so funny as I thought the tiny bit of roundness that I could quite clearly see (!) on my tummy was the start of a bump – now look at it! I don’t know if I’m going to be able to get into those PJ bottoms for much longer either, oh dear! In the last few days I have slept a little better which is a relief but I imagine this will be short lived. However, I have had increasingly achey ribs instead where everything is getting more squashed and pressed together as the baby grows. I hope it doesn’t get too bad as the only way that will become more comfortable is when the baby finally drops down in preparation to come and meet us. I also ordered a few more bits from our list, namely: Nappy bin and nappy sacks to go in it (my younger sister Sabra gave me a great tip to save money on the expensive nappy bag canisters you are told you need as you can find cheaper refills on Amazon like the one I have just purchased that is compatible with our Anglecare bin); baby cleaning cloths for in the bath/giving them a quick wash or wipe and re-usable breast pads. I do have some disposable ones but wanted to try washable ones too as they are better for the environment in the long run. I also put the deposit down on our birth pool package ready to collect in five weeks’ time!